Are you suffering from work rut symptoms? Whether it's out-of-date paper processes, too much information being routed or stored in email, or workarounds for file sharing restrictions, the work rut is sucking energy away from your primary focus: your customers. Don’t worry, you’re not alone. Imagine being able to focus on delivering exceptional service, innovating, and growing your businesses. 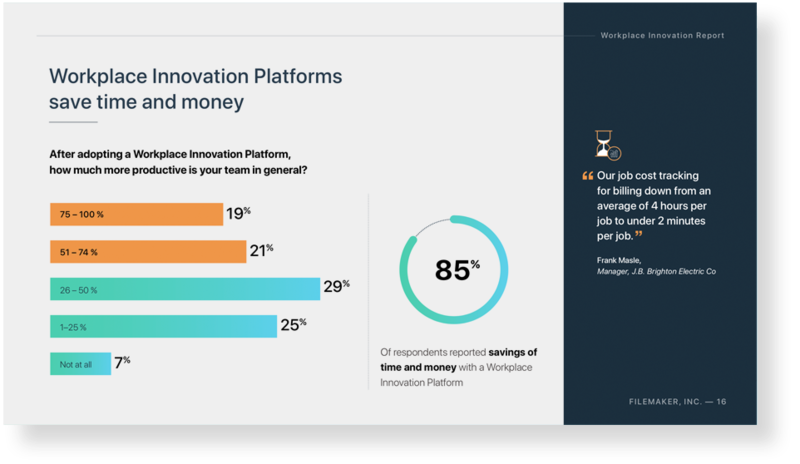 Most businesses that implemented a Workplace Innovation Platform saw tangible benefits with their costs going down and productivity going up. Our job cost tracking for billing was brought down from an average of 4 hours per job to under 2 minutes per job. — Frank Masle JB Brighton Electric Co, Inc.